The New York Yankees and the Toronto Blue Jays will finish off their three-game set today inside the Rogers Centre with the third interesting pitching matchup of the series. Happy Sonny Gray Day ladies and gentleman as the Yankees send their newest toy and acquisition to the mound for the second time in his Yankees tenure. It’s a shame Gray couldn’t pitch tomorrow as the Yankees begin a series with the Boston Red Sox but what can you do, right? 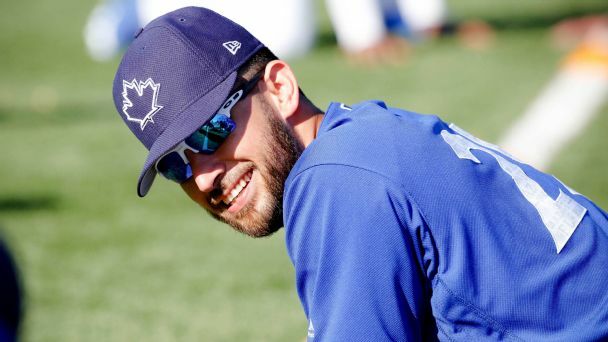 Opposing Gray on the mound for the Blue Jays today will be Marco Estrada. Good luck to both teams. Gray took the loss in his Yankees debut against the Cleveland Indians allowing four runs, just two of them earned, on four hits in six innings of work. In Gray’s final start as a member of the Athletics the Toronto Blue Jays tagged Gray for four unearned runs. Estrada has been solid in his last two starts lasting at least seven innings in both. Estrada will be making his team-leading 24th start tonight for Toronto and will look to play spoiler for the Yankees who are still in the hunt for a playoff spot. The game will be played at 7:07 pm ET inside the Rogers Centre in Toronto, eh, and can be seen on the YES Network and MLB TV. You can also follow along in your cars and on the radio by tuning into the WFAN broadcast with John Sterling and Suzyn Waldman. Enjoy the game and let’s get the hell out of Canada. Back to the states! Go Yankees! !